A Brave New (connected) World. For decades the marketing of technology has fallen into two distinct silos. On one side are the products and services that are sold to the end consumer. This marketing is known as Business to Consumer, or B2C marketing. On the other hand, there are the companies that sell products and services to other companies. This is known as Business to Business marketing, or B2B. Unfortunately, the world of connected devices, known by the more familiar term, Internet of Things (IoT), is changing all of this. The days of marketing, and marketing platforms, being built around the concept of a standalone product or sales channel are going away. In their place, we are entering a new generation of products whose very reason for being is their ability to connect to the world around them, to other products, share data, and become part of a larger ecosystem. This idea of an ecosystem is at the heart of the problem for marketers when it comes to IoT. In reality, what is needed is neither B2C nor B2B. Marketing organizations need to start planning now to capitalize on IoT to drive customer engagement and demand generation goals. See how you stack up against your industry peers and find out from AdWords experts what the report means for you. DWA joins Datorama for a discussion on how to identify the data that is most relevant to your business goals, set up a measurement framework that accommodates multiple data sources, and glean actionable insights from data visualizations. Are you a marketer looking to learn how to engage and influence purchase behaviors with today’s savvy buyer? We’ve got you covered. In this webcast recording, the DWA, Brite Content, and Dfuzr Industries teams share how to combine intent marketing, video content marketing, and conversational experiences in a framework that will give you immediately actionable insights and tactics to deliver delightful and high-converting campaign experiences. A must-watch session for Content, Performance, and Video Marketing professionals alike. Along with social media, the use of web based marketing has drastically increased over the last 10 years. At one time an invitation to a webinar was occasional, now many people are bombarded with invitations. The key to breaking through this clutter is not the “shot gun” approach but something that is effectively focused on the subject matter that matters most to your audience. This could be new or existing customers, partners, resellers or any other group that makes your business effective. Community marketing is an effective way to match the right marketing message with the right audience. Paul Waadevig, a consultant to top conferencing companies for over 13 years will show you effective ways to build and effectively engage your communities, leverage existing marketing material content by customizing it for different audiences, and partnering with others in to co-brand your message effectively. Learn how to expand and build your pay per click (PPC) and search strategy to increase brand engagement and drive sales. Emily Rucker, Director Search and Social of DWA Media, will share insights from both B2B and B2C programs. - What digital marketing trends are crucial to optimize search and social marketing? - What should you consider mobile search? - How are marketers benchmarking search and social campaigns against those of competitors? - What should you look for in a paid search account audit? - What technologies are available for tracking these programs and tying success to revenue? 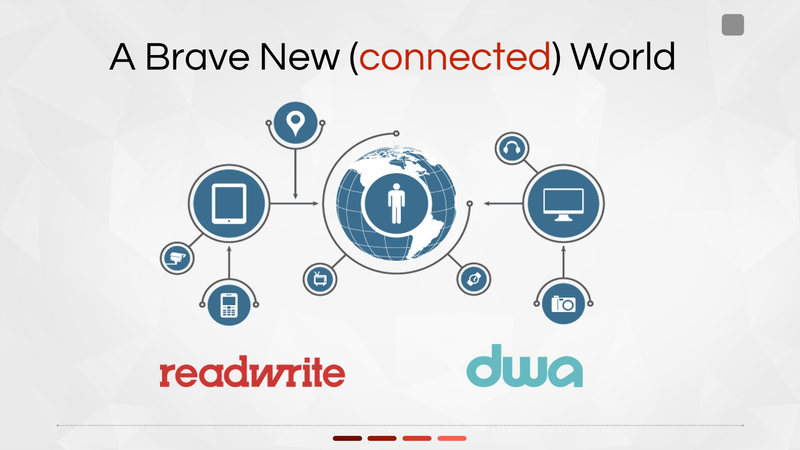 DWA is a new kind of agency with its feet in media and its head in marketing, data and analytics. We’re fanatical about the art and science of engaging people and thrive on delivering imaginative thinking, unexpected clarity and tangible impact in a complex communications landscape. We have earned our position of global leadership by providing unparalleled levels of support, service and expertise to the world’s most successful and respected technology brands.